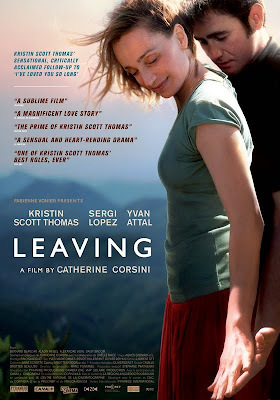 Leaving - Suzanne is a well to do married woman and mother in the south of France. Her idle bourgeois lifestyle gets her down and she decides to go back to work as a physiotherapist. Her husband agrees to fix up a consulting room for her in their backyard. When Suzanne and the man hired to do the building meet, the mutual attraction is sudden and violent. Suzanne decides to give up everything and live this all engulfing passion to the fullest. As the frustrated wife prepared to risk everything for passion, Scott Thomas gives a rich, captivating performance while Corsini's skilful direction captures the subtleties of emotion and character as the story propels itself toward a shocking end.